I started blogging on October 4th, 2013 and I just hit my 6 months bloggaversary this Wednesday! My favorite part of book blogging is writing the book reviews and discussing it with fellow bloggers and just people in general. If you guys didn't know, I have a really difficult time executing my thoughts because I had speech delay when I was younger, which I'm guessing is why my speech is a bit jumbled up. I can formulate it very well, but when I try to express it, it doesn't really come out the way I wanted it to be, which is partially the reason why I post my book reviews on my blog and not my booktube channel. I mainly blog young adult novels, however, I do expand into other genres too so you will see a wide variety of book reviews every once in awhile. Whenever someone asks me this question, it takes me awhile to answer this because I have a lot of favorite books. Even if you give me a million dollars, I will never answer that question because it will be unfair to the other books that is on my favorite's list but have not been mentioned. Besides from the fact of meeting people with the same interests as me, I would have to say being able to interact with the authors. Before the social media network occurred, these authors were just these non-existence but existence authors to us if you guys know what I mean. Now that we have blogging and the social media networks, we now have the ability to converse with them and I really enjoy that part of blogging the most. 1. Neverwhere by Neil Gaiman - So fabulous! 2. Beekeeper's Apprentice by Laurie R. King - a brilliant 15 year old girl matches wits with the retired Sherlock Holmes. 3. The President's Daughter by Ellen Emerson White and its 3 sequels - a great series set in the 1980s. 4. Rocket Boys by Homer Hickam - the book that the movie October Sky is based on, which I loved. Spring is in the air! Show off your favorite outdoors reading spot. If you don’t go outside...well where else do you read that isn’t inside your house? We want pics! Love the challenge for next week. I may have to take a picture of my favorite spot before the snow melts so when it's 100 degrees outside and I'm complaining I can't read outside I'll have a memento of the cold. I haven't read any of these yet. Beekeeper's Apprentice by Laurie R. King looks really interesting. I love Sherlock Holmes. I loved Neverwhere - it actually might be my favourite out of all the Neil Gaiman books, which is really saying something because I've loved everything I've read by him. Beekeeper's Apprentice seems like something I would enjoy immensely. Happy Friday! 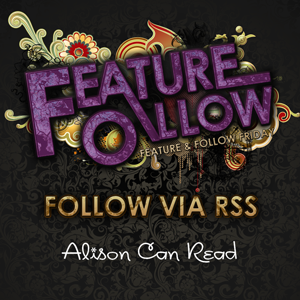 Thank you again for choosing me for this week's feature Alison! And I so excited for next week's FF! Yes! I need to read Neverwhere! I've heard so many great things about it! It's safe to say that I've never heard of any of those books. I've only been reading constantly for about 3 years so this is going to be a tough one for me. I've read Stardust by Neil Gaiman but never any of his other books, I think I should give him another a try. I haven't read any of those. Maybe I should check them out. I haven't read any of your backlist faves, Alison, but especially the Beekeepers Apprentice sounds awesome! Yup, those are all totally new to me! How awesome is that?!?!! Great mind thing alike, I have Neverwhere by Neil Gaiman on my list too :) I can see that you have great taste so I need to check out the other books you named here. I've never read Neverwhere, but I love Neil Gaiman so I should probably check it out. Next week's theme is great! Hopefully it warms up and feels more spring-y here so that I can take photos that aren't full of snow. Hi Alison! Happy Friday! One of my all time favorite books is The Secret Garden. Love the story! I love Neil Gaiman and love Neverwhere too.... I picked his The Graveyard Book as one of my choices! I have not read those. Will check out to see what tneyre about. Thanks!